As I was getting ready for school this past week, I pulled out my “1st day of math” folder. Tucked inside is an article I read to my gr. 7/8 students in our first math class of the year. It’s not your usual “tips for math success” or “review of long division”. 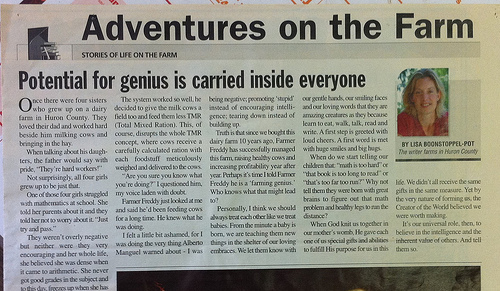 It’s a copy of an article published in 2007 in our provincial farm paper, The Ontario Farmer. “Potential for Genius is Carried Inside Everyone”, was written by Lisa Boonstoppel-Pot, a local writer who farms in Huron County with her husband and children. It’s a beautiful piece with a powerful message for our students. When I read it, I always have to catch myself before my voice begins to crack. I found it just as emotional this year. As usual, the room became very quiet as I moved through the story. However, what was different this year was the response from my students. When I finished reading, one of my gr. 8 boys starting clapping. Slowly, quietly, sincerely. Soon others joined in. And before long, the entire class was smiling as they connected with their inner genius. After receiving that reaction, I wanted this story to be shared with other teachers, so I contacted Lisa through Facebook to see if it was posted anywhere online. It wasn’t, but after some searching, Lisa found and sent me the copy stored on her computer. Not surprisingly, all four girls grew up to be just that. One of those four girls struggled with mathematics at school. She told her parents about it and they told her not to worry about it. “Just try and pass.” They weren’t overly negative but neither were they very encouraging and her whole life, she believed she was dense when it came to arithmetic. She never got good grades in the subject and to this day, freezes up when she has to do a difficult calculation. The farm girl married and had daughters of her own. Believing she was ‘bad at math’ she knew she’d never be able to help her daughters with their math homework so she told her daughters something different than what she heard growing up. She told her daughters they were geniuses at math. The girls believed it. They come home with ‘A’ grades on their math tests. When asked what her favourite subject is, her older daughter will answer: math. The mother knows that they really aren’t geniuses but that doesn’t matter. The girls believe they are. When they come across a difficult problem they don’t get frustrated and quit, believing they are incapable of answering the problem. Instead, her girls believe they have the brainpower to figure it out. So they do. This story came to me after hearing a blurb from Canadian Writer Alberto Manguel who was speaking on CBC radio about how our culture makes kids stupid. He suggested that we are born intelligent, fully capable of successfully living in the world. However, today’s culture seems intent on making us believe we are stupid. I did it just today! Facing a shortage of feed since there wasn’t enough haylage to top the silo, Farmer Freddy decided to pasture the heifers on the alfalfa fields. He purchased more steel fence posts, shock wire and strung a temporary fence around the field. The heifers were introduced to their new grassland and happily started munching down the rich forage. Each day they are out saves Farmer Freddy feeding one large square hay bale. The system worked so well, he decided to give the milk cows a field too and feed them less TMR (Total Mixed Ration). This, of course, disrupts the whole TMR concept where cows receive a carefully calculated ration with each foodstuff meticulously weighed and delivered to the cows. “Are you sure you know what you’re doing?” I questioned him, my voice laden with doubt. Farmer Freddy just looked at me and said he’d been feeding cows for a long time. He knew what he was doing. I felt a little bit ashamed, for I was doing the very thing Alberto Manguel warned about—I was being negative; promoting ‘stupid’ instead of encouraging intelligence; tearing down instead of building up. 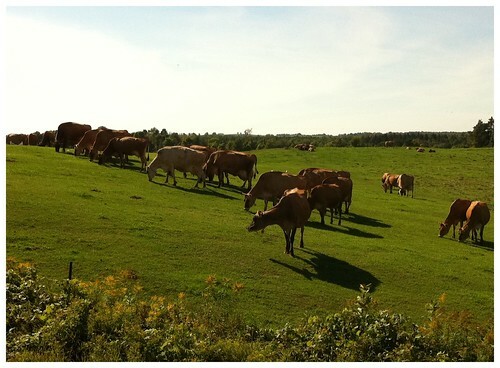 Truth is that since we bought this dairy farm 10 years ago, Farmer Freddy has successfully managed this farm, raising healthy cows and increasing profitability year after year. Perhaps it’s time I told Farmer Freddy he is a ‘farming genius.’ Who knows what that might lead to? Personally, I think we should always treat each other like we treat babies. From the minute a baby is born, we are teaching them new things in the shelter of our loving embraces. We let them know with our gentle hands, our smiling faces and our loving words that they are amazing creatures as they learn to eat, walk, talk, read and write. A first step is greeted with loud cheers. A first word is met with huge smiles and big hugs. When do we start telling our children that: “math is too hard” or “that book is too long to read” or “that’s too far to run?” Why not tell them they were born with great brains to figure out that math problem and healthy legs to run the distance? When God knit us together in our mother’s womb, He gave each one of us special gifts and abilities to fulfill His purpose for us in this life. We didn’t all receive the same gifts in the same measure. Yet by the very nature of forming us, the Creator of the World believed we were worth making. It’s our universal role, then, to believe in the intelligence and the inherent value of others. And tell them so. Sitting on the train, on the last leg home, I want to secure the magic of UnPlugd11. It’s nourishment that I’ll continue to reflect upon as I challenge myself in my personal and professional life. 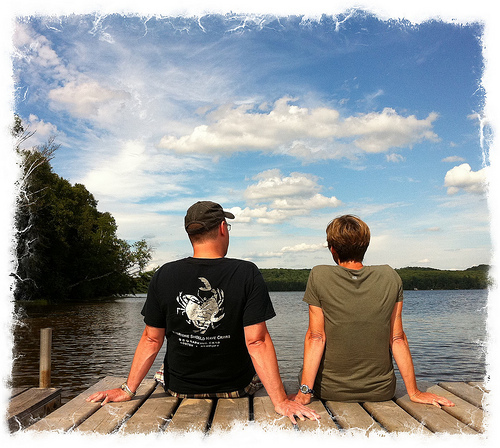 Held at the Edge, a beautiful “off-the-grid” retreat in Algonquin Park, Unplugd11 was a three-day meeting of 37 Canadian education advocates – teachers, administrators, parents, trustees. We all came prepared with an essay and narrative entitled, “Why ________ Matters”, which we shared with our peers for further editing. No internet, no cell service, no devices. We were truly unplugged, but very much connected. During the group meetings, the layers were peeled back as participants shared successes, stumbles, frustrations, questions, guidance and feedback. We were challenged to travel down new paths, even if they were steep. Disturbance. From “Cut the fat” and “Claim it, you’re the expert” to “I love you guys”. We recharged. On a morning run down the long gravel road, out in the blue Swift canoe, sitting on the dock as the afternoon passed by. These were the settings that framed some of those moments when the magic appeared with these passionate collaborators. It was a place where I finally got to meet my teaching partner, and friend, Clarence Fisher, face-to-face. Read the book Mindset by Carol Dweck, recommended to me by @Stephen_Hurley during an evening conversation. Dig through the Livescribe instructional resources. First use for me, pencasts to support students in my triple-grade math class. Put apples in my basket (@joevans)! 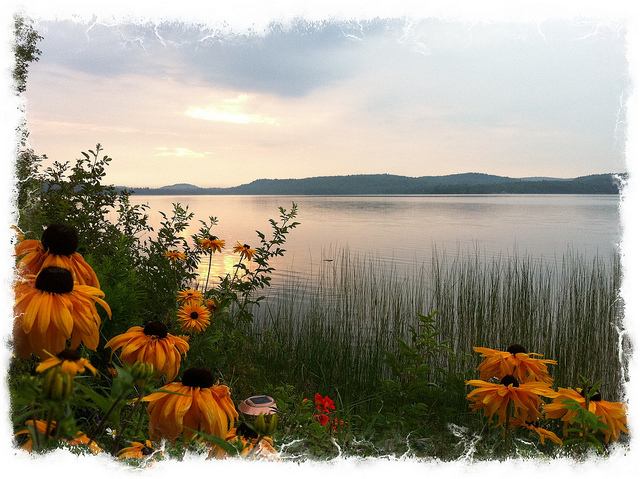 Register & train for the Run-off-the-Grid trail race with Alana Callan on Sept. 24. If we can’t convince @charbeck to be our pace bunny, we’re counting on him for his continued inspiration. Anyone else in? Absorb, reflect and question each message in the soon-to-be-published, “Why ___ Matters” essays. How does each message relate to my students, beliefs, and professional development? Deepen connections with the participants, and other educators who push my thinking, as we continue to take risks in an effort to transform our practice for our students. My friend, Andrew Forgrave recently wrote about unleashing creativity. “Frameworks and boundlessness need to co-exist. Discipline and chaos can sit side-by-side and juxtapose to make something.” Reassurance for taking risks. Moving forward with renewed confidence, I’ll share the messages that for me, define unplugd11. Thank-you Rodd, Ben and the entire organizing committee for a memorable experience. Learning is about conversation. Over the past year, I have had the opportunity to participate in the Ontario cohort of the Professional Learning Practices (PLP) project. This project brings educators together to participate in self-directed professional development involving 21st century learning environments. By helping to create “communities of learning”, educators connect through a Ning for the opportunity to have important online conversations about the changing learning environment. As part of the “Avon-Maitland After School Special” group cohort, I had many conversations with Susan Carter Morgan. Susan is a grade eight teacher at the Fredericksburg Academy in Virginia, and was one of the resource people brought into the project to initiate and help develop discussions. As a result of our shared interest in a classroom where learning was more inquiry-based, we decided to develop a collaborative project. Students from our two schools were grouped together to study an issue of social justice using web 2.0 tools. These tools help students put the best practice of collaborative learning into play by working with others to problem solve. 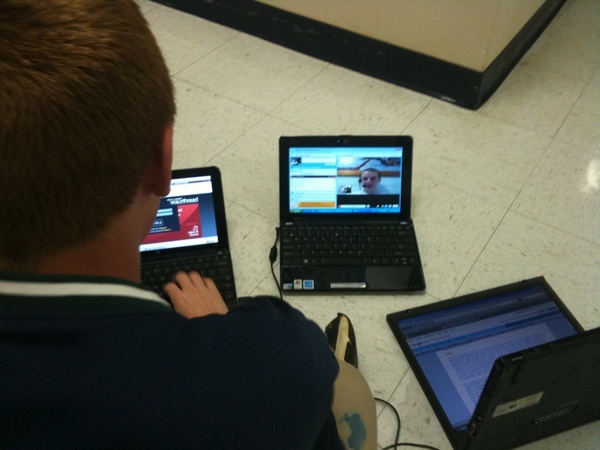 Tools such as VoiceThread allow teachers to practice differentiated assessment. Being socially connected, students believe their contributions matter and they feel a stronger degree of responsibility to support their new partners. Students want an authentic audience to express themselves to. Over a period of a few months, Susan and I developed the project, setting deadlines for each step and creating checklists and rubrics. Research would be collected and organized using Google Docs and Skype, projects would be presented using VoiceThread, and students would post comments on other groups’ projects in the final step. During the month leading up to the project introduction, my students were involved in several activities focused on the Convention on the Rights of the Child and the Universal Declaration of Human Rights. Throughout the year, they had been immersed in questioning structure to develop critical thinking through board directed PD. Students in Virginia read To Kill a Mockinbird and studied social injustices. As a result, students came into the project from different perspectives, providing a rich mosaic of background knowledge. To begin, my students set up a shared Google Docs research templates with their partners in Virginia. Respectful discussions began, including topic choice and the development of their essential research questions. The students’ process mirrored the steps Susan and I had practiced a month earlier. 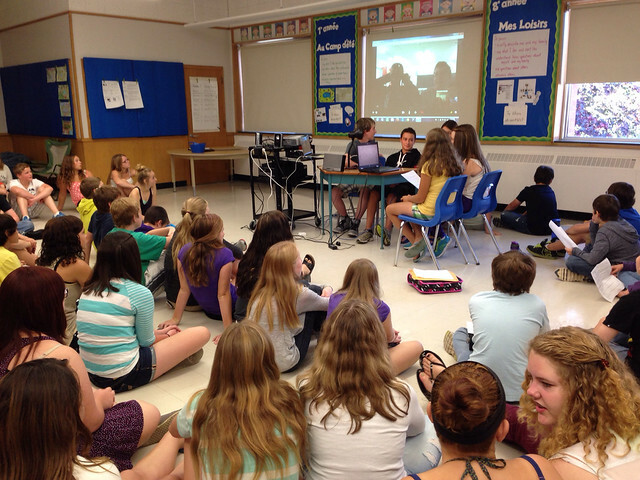 Using Skype in the classroom, students introduced themselves and developed relationships in and outside of school hours. Many days, rather than go outside for break, groups of students from both schools would stay in and Skype with each other. The chatting and laughter in the room was beautiful as students from both countries formed friendships not only from within their own groups, but others in the class as well. 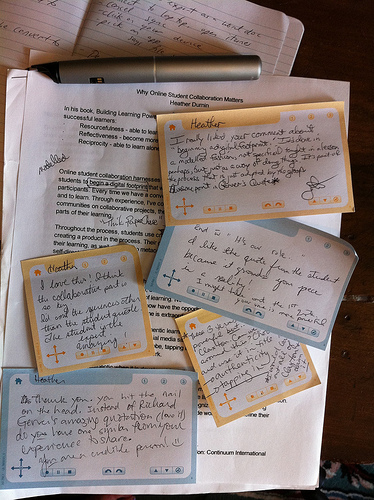 Meanwhile, Susan and I provided feedback as the students’ shared documents grew. Yes, there were glitches along the way. Some students from both schools were away for extended periods, others struggled with the idea of having to develop their own research questions. They wanted to be told. But as the weeks moved on, the students pulled together and our classrooms became one. Their ability to develop and work collaboratively moved the project along, even if one of us couldn’t physically be in the classroom with them on a daily basis. 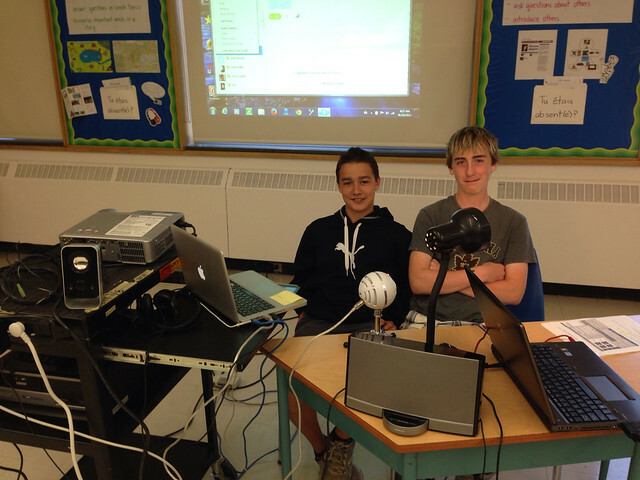 As the research was completed, students in Virginia set up the shared VoiceThread for the final presentation. Each group member posted a Creative Commons image and added commentary based on the research. Once the completed VoiceThreads were posted on the project wiki, students posted comments on other groups’ projects. 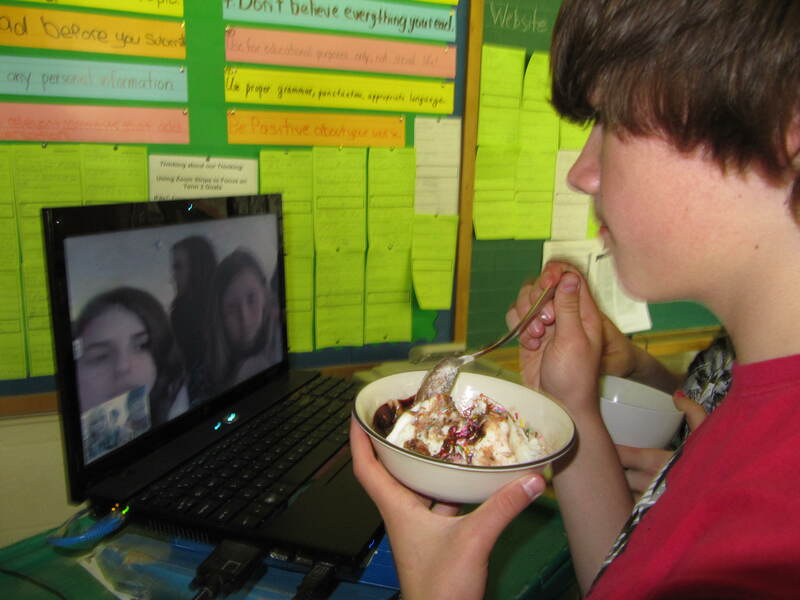 In celebration, our classes came together once again via Skype for an ice-cream sundae party. Afterwards, students posted their reflections about the project on a VoiceThread. Every time we have a conversation with someone else, we open new opportunities to grow and to learn. So what did they learn? Our students started to think more about the meaning of community and the world than just themselves. They developed a global conscience and relationships with each other that continue on, even though the project is complete. The students however expressed it best. Thanks to the connection made through a PLP project, students and teachers from different countries have indeed experienced something very extraordinary. Though I have been involved in several collaborative, online projects with teachers, I had never tried one that involved so many levels of thinking, so many tools, nor to be distributed over such a long time period (more than we initially envisioned). However, by the end, I must say this social justice unit with the Turnberry School was the most satisfying for both my students and me. My students had only recently begun bringing their laptops to schools, so their experience with online tools had been limited to Google Docs. Though in hindsight, I wish we had helped the students organize their thoughts a little more on their documents, most figured out ways to communicate using color codes and bullets. I loved watching their thinking develop as they found resources and had to determine what information to use and in what order. Learning Skype and using it to connect with students from Heather’s class was fascinating. Some immediately jumped in knowing how to use the tool to gather information. Others seemed shy and reluctant to share. The project lent itself to conversations about time management, online digital “footprints”, critical thinking, and presentation skills. Yet, each topic fit easily and seamlessly into the day to day learning. On a personal note, I found the tools extremely helpful when– mid-project –my father died. From another city, I was able to check my students’ progress online and use Skype to connect with them. Heather even Skyped into my class, teaching my students the next step. It was all pretty amazing, now that I think back. Our project embodied the true use of online tools–the ability to connect and communicate wherever and whenever. Though Heather and I often “chatted” in the evenings to check in on the project, we soon found the students doing the same–and learning about each other in the process. By the end of the project, even the students who had expressed frustration initially were sharing what they had learned. One student wrote in her final portfolio that the project had been the most meaningful “in all her years at FA.” She said the learning to collaborate with students from another country on a topic that she wanted to learn about made it powerful. The project for her didn’t seem like school, and yet she said, she learned more about thinking, organizing, and presenting than she ever had on anything else. Her sense of pride was palpable as she talked to other teachers in our school, expressing her joy of learning. Working in ways that empowers students brings new issues/concerns to the classroom, such as digital literacy and safety. However, what better way to “teach” these than through a project that adds meaning to the students’ lives. This was such an authentic way to learn. Thanks Susan for your comments, friendship and great conversations. H. D.